“After Earth” is serious business. Just check out the perma-scowls on the faces of Will Smith and his son Jaden on the poster. So serious that it is totally boring and emotionally empty despite the fact it is, in essence, the story of a boy growing up and earning the respect of his father. The film looks great and several pieces of the sci-fi tech are interesting and feel organic, and though director and co-writer M. Night Shyamalan (who is notably absent in advertisements for the film) has some interesting ideas, the world – and more importantly the characters that inhabit it – are bland and lifeless. About 1,000 years before this story humanity was forced to flee Earth when it became uninhabitable; the evacuation to a new, desert planet led by the Rangers – an elite military group. But a new danger waited in the form of alien beings called Ursa that are blind but can smell human fear and use it as a tracking system to attack. Fearless (literally) Ranger leader Cypher Raige (the elder Smith) is the ultimate weapon against this threat and a respected General. It seems to me a good old-fashioned ray gun or laser seems a lot easier than the cockamamie “Ghosting” technique – where a human removes all of their fear to remain invisible from the Ursa and then use a retractable sword to strike them down. I’d much rather keep my distance from the creatures and pick them off, but maybe this peaceful society has passed sweeping gun regulations or something. Cypher’s son Kitai (Jaden Smith) has just failed his final tests to become a Ranger, but is sent on a training mission with his father to another planet. As the matriarch of the Raige family lays out there for Cypher – and the audience – Kitai “needs a father more than a commanding officer.” This line and many others spoken in a weird accent that sounds like an Australian/British hybrid, though for every character this dialect seems to come and go. A spaceship sets off with Cypher, Kitai and a bunch of other Rangers or Rangers in training; as well as a trapped Ursa to be used for Ghosting training. The ship is besieged by an asteroid field and crash lands on Earth – the Raiges the only known survivors, though Cypher is badly hurt. Now it’s up to Kitai to retrieve an emergency beacon from the ship’s tail section, located across a treacherous stretch of Earth terrain. This is an Earth that we’re told has dangerous temperature fluctuations where everything freezes at night, though the lush vegetation doesn’t seem to have a problem snapping back into shape each morning. And also that “everything on the planet has evolved to kill humans” even though no humans have lived on the planet for a millennia and the most dangerous thing is the Ursa they brought with them. But not to bother with those details. The failure of “After Earth” is a complete lack of adventure or forward momentum. There are long stretches of pensive looks, pauses and robotic dialogue that derail any sense of excitement. One thrilling sequence involves Kitai removing toxins from his body after a leach latches on to his hand, but that is the only time the danger and dread that is oft discussed is actually felt. Adding to the dreariness is one of the most charismatic action actors of his generation being relegated to staring at monitors and spurting out monotone words of advice and orders to his son. 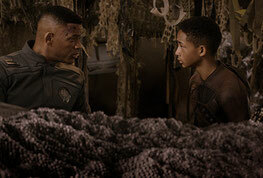 Clearly “After Earth” is designed as a vehicle for Jaden Smith to try and showcase the skills of his father. Jaden is perfectly serviceable as Kitai, but I’m not sure who wouldn’t be. There is one scene to showcase some emotion, but it is handled with whines and yells that don’t exactly endear us to the character. We don’t feel the desperation of a son attempting to win the approval of a distant father, only petulant rebellion. Ingredients exist to craft a family story amid a spectacular sci-fi backdrop, but the family isn’t interesting and neither is the backdrop. We are made aware early on that Kitai’s sister was killed by an Ursa and her young brother failed to act; and therefore we know there will be a final showdown between Kitai and this Ursa on Earth and he will have to conquer his fear. It all just plays out as straightforward as can be. By the time Cypher gives a gesture of acceptance to Kitai near the end of the film, it feels more comically trivial than heartfelt or meaningful.